What is the Best Acrylic Paint for Artists? My Recommendations! 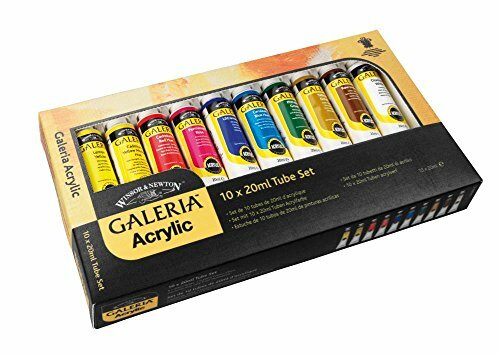 What is the best acrylic paint for artists? What is the best acrylic paint brand for artists or brands per se? If you plan to take your art seriously (Kudos to you, by the way!) you need to take your materials seriously too. Acrylics have their advantages: unlike oils they don’t smell, they mix and clean up with water so you don’t have to deal with “turp” or chemicals. Acrylics are a great medium to work with but do keep in mind that not all of them are created equal, or equally good for every endeavor. Professional acrylic artist paint is different from "hobby" acrylics! Professional acrylic artist paint is different from “hobby” acrylics! I’ve worked with craft paints that come in the wide array of colors that are a dime a dozen and while they have their place, I do not recommend them as a serious painting medium . In my experience they are too thin and I had to use multiple coats to achieve the desired result. To make your painting workflow as smooth as silk you need professional grade acrylic artist paint, not the kind for crafts, model airplanes, things like that. It should have a certain viscosity, thickness and richness to the paint itself, and provide good coverage. Having worked with a number of brands and types, my all-time favorite of them all is Liquitex. 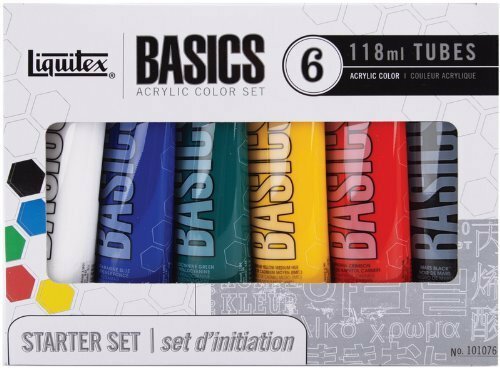 It has a few variations, including Liquitex Basics, Medium and High Viscosity. It’s my go-to brand for having a great range of colors, mixability, permanence and flexibility. You have several options in terms of delivery; small 1 oz jars, larger quantity jars, and 4 oz tubes. The 1 oz jars have a flip-top for easy dispensing and a wide color range that is not limited to the “main” artist palette colors. You may discover a variation called “Heavy Body”…When I first started using Liquitex often, the jars stated “High Viscosity” which is pretty much synonymous. This type is richer in pigments and thicker; it would be great if your specialty is a technique like impasto, as you will have a good workflow in terms of using a combo of brush and knife techniques that require skill, and you don’t have to worry they will dry too quickly. But all in all, this color range, different delivery options, and the choice of medium viscosity (“soft body”) and the slightly denser, richer “heavy body” options, give Liquitex a leg up on some other brands, which is why I think it’s the very best acrylic paint brand for artists taking their work seriously! There are several other brands I like as well that I’d like to pass on – Reeves with the cute little dog logo on the box I like them and they’ve been around a long while. I was pleased with the general flow and texture of the paints overall; it’s just that the tubes are teeny and easy to run out of a color that I used more often. 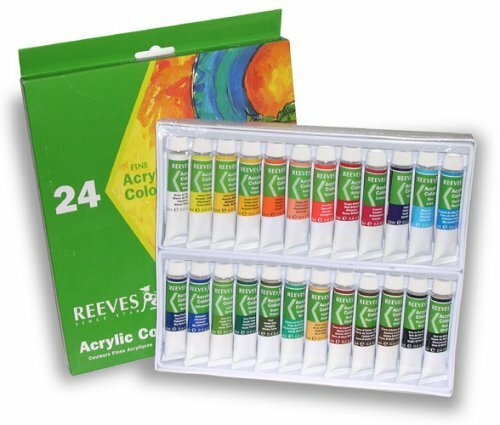 However I’d say that’s the only negative – I love me some Reeves paints and use them quite regularly! 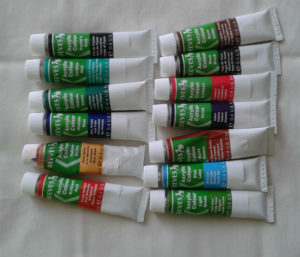 Third best professional acrylic paint in my lineup is Winsor and Newton, and that’s a brand that excels at being both quality and affordable. The viscosity is excellent when working. As with Liquitex you have a fair amount of size and dispensary options to suit your needs. 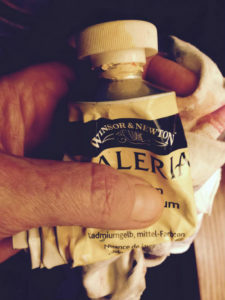 Winsor and Newton makes a version called “Galeria” which is top notch with rich pigments in 60 ml (2 oz) tubes. You have the option of getting a set of 6 which will contain the most important colors but there are also larger quantity sets. There are also larger size 4 oz, 200 ml tubes (6.75 ounces) The high opacity makes for a great workflow for brush and knife techniques and not having to apply multiple coats. In general, it carries a medium viscosity product. The most important reason to choose a brand like the ones above is that you don’t want to spend all your time trying to get the “right” consistency of paint – acrylics that are too thin (low viscosity) may dry too fast before you know what you’re doing next, may leave behind stray brush marks, or may not layer well. If you find that you only need a dab of water at a time to distribute paint evenly then you’ve got a good paint flow going, as it should be! Individual tubes are easily purchased but it can be a better option to choose a “starter pack” with the most important colors – if you’re fairly advanced in the knowledge of color mixing then the process of doing so should come naturally with good quality paint!